Ready to start building your own MultiQuad? This section of the site is designed just for you. 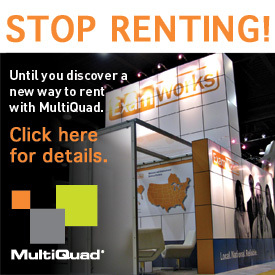 You'll learn more in depth information about how MultiQuad work to meet your trade show needs. As we learned in the Exploration section, MultiQuad is a unique exhibit system that is composed of interchangeable frames and Quads, that allow you to configure with ease to meet your booth specifications. Have a change in booth space? MultiQuad can easily adapt. Larger or smaller, wider or taller, MultiQuad can take on any configuration up to 16’ in height. If you lack the necessary components needed to create a specific arrangement, we have a rental collection available that you can pull from to get the look you desire. For example, a side return (see photo) adds 32 square feet of display area on the inside, 8 on the front edge and 32 more on the back for a total of 72 more square feet of exhibit area! Shows allow you to come 5' forward with 8' tall structures—take advantage of that with MultiQuad. MultiQuad is made from a combination of light-weight, eco-friendly aluminum frames and 23" x 23" Quads. The frames are the basic building blocks of the MultiQuad system. By combining various frame combinations, you can create a MultiQuad that arranges for any size booth space. Frames are available as either standard (12" deep) or MAX (23" deep). MAX frames allow for you to build exhibits up to 16' in height for large towers and island configurations. All components are available in either Standard or MAX sizes. To view full library of available components, click here. Quads add the graphic surface to the MultiQuad frames, by attaching with magnetic strips. Quick and easy to attach and move around, each Quad is individually mounted so it is simple to change Quads to restructure your marketing message...even during a show. All Quads are printed with a black reveal around the edges for a modern look that also serves to help preserve the printed message when displaying on uneven trade show floors. Quads can be printed in any color, pattern or design you wish. We even offer a faux-wood and dry-erase surface finish for unique appearances. Check out a sampling of the Quad options available to you by clicking here. MultiQuad supports monitors up to 42"
The MultiQuad™ exhibit systems can support monitors up to 42" with ease, while remaining portable and tool-free. The monitor is supported inside the MultiQuad frame flush with the front of the display so that only the LCD screen is visible for a clean, finished look that competitor’s cannot duplicate. And since MultiQuad has the unique Quad system that allows you to interchange and move graphics within seconds, you can also reposition the monitor to various locations as needed. Each MultiQuad is built using a thumb screw locking system so you never have to worry about tools for your assembly. Simply twist in place and your MultiQuad frames will be securely positioned. Each piece of every component is clearly labeled with piece names, locations and color-coding, so you don’t even need assembly instructions. Instead just build the system like you would a paint-by-numbers, matching the like colors and labels. MultiQuad requires very little packing space. 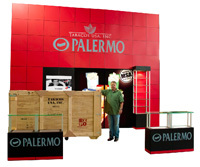 A standard 4’ x 1’ x 8’ MultiQuad tower is 32 cubic feet of exhibit, but it takes only 3 cubic feet of packing space. You can pack an 80 foot long tower (enough to build a wall all the way around a 20’ x 20’ booth space) into one crate. This will save you tons on shipping and storage charges. The entire 16’ tall exhibit packed and shipped in the one crate shown. Ready to create your own MultiQuad? MultiQuad is fun and simple to design on your own. ExpoDisplays offers pre-designed kits you can order or you can come up with your own configuration using our component library stored on Google SketchUp. Click here for more info on how to get started.